Showers doused the Southland Tuesday and a winter storm warning was in effect in the San Gabriel Mountains in Ventura and Los Angeles counties, where the snow could fall as low as 2,000 feet, threatening hazardous travel conditions, including on Interstate 5 through The Grapevine and Highway 14 through Soledad Canyon, forecasters said. “Showers will continue through this evening, with a chance for lingering showers over the northern slopes into early Wednesday,” said a National Weather Service statement, which added that a winter storm warning, which denotes dangerous travel condition, will be in effect until 4 a.m. Wednesday. “Snow levels will lower to between 2500 and 3500 feet this morning, and eventually fall as low as 2000 feet tonight. This will lead to an increasing threat of accumulating snow on some of the lower mountain passes … this morning through tonight. This would include the Interstate 5 corridor near The Grapevine, Highway 14 through Soledad Canyon, Highway 33 north of Ojai, Highway 154 through Santa Barbara county as well as highway 166 through the Cuyama Valley. Between 8 and 14 inches of snow are expected to accumulate through early Wednesday above 7,000 feet, with 2-4 inches possible at 4,000 feet, including Interstate 5 near The Grapevine,” according to an NWS statement “Lighter snow accumulation will be possible as low as 2,500 feet,” along with south-to-southwest wind gusts of 35-45 mph. 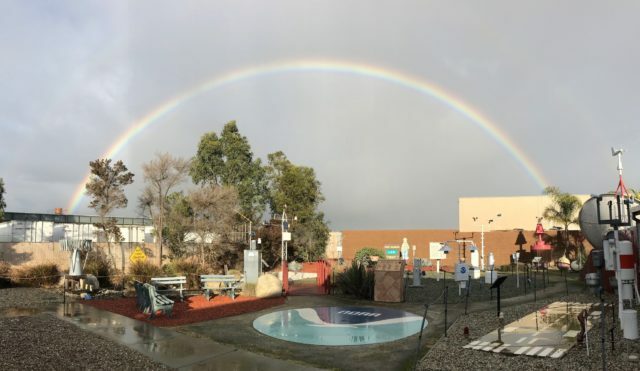 The NWS forecast showers Tuesday and cool temperatures, including 34 degrees on Mount Wilson; 44 in Palmdale and Lancaster; 49 in Saugus; 52 in Pasadena; 53 in San Gabriel, Burbank,and Woodland Hills; 55 in Downtown L.A.; and 56 in Long Beach, Avalon and at LAX.